Enjoy the latest entry in our "All About Apps" series! Earlier this year, a friend and I put down a payment to take a Europe trip , something I have been dreaming about since I was about 9 years old. Although my trip isn’t until the summer of 2017, I am already looking into tips on what to bring, what not to bring, and what to learn. Although I know I’ll only be in each country for a few days, I would still hate to offend someone or get lost and not know my way back. How do I plan to prepare? Google Translate. 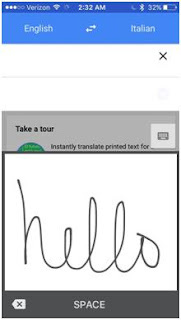 Google Translate is a free app available for Android and iOS. While these apps are more accessible while on the road, you can also go to the Google Translate website. 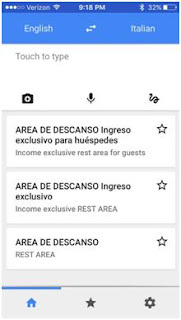 The Google Translate app has four different translating options: typed text, written-to-text, voice-to-text, and (what I like to call) camera overtake. Here is what the app looks open. Each function is clear to find, without having to search the entire app. You can also see some of my failed attempts at speaking Italian. I honestly can’t tell you what I was trying to say. Typed text is what I’m sure everyone is imagining — type what you want to translate, hit enter, and what you need is translated to the desired language. The same happens for each of the other parts of the app but with a little twist. Written-to-text is where you are able to write in a window on the app and it will take what language you are writing in, and translate it into the desired language. The same goes for the voice-to-text; talk into the microphone, the app will detect the language you are speaking and translate to what you want. Here is an example of the written-to-text function; although I took the screenshot before the translation could pop up. Spoiler: it translates to “Ciao”. What I feel is the game changer for this app, especially for travel purposes, is the “camera overtake.” The app is able to access your camera with this function. You simply point your camera to a sign/book/map (etc.) and the app will translate what the sign is saying into your desired language. This is where I feel that this app would be very beneficial to travelers or businesses that come across a language barrier. Here is an example of the “camera overtake” function. 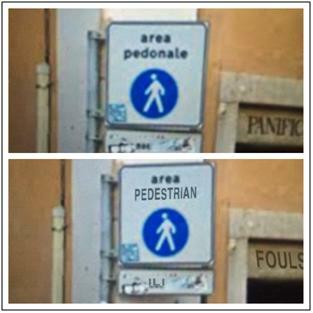 I went to the Trevi Fountain through Google Maps, chose the street view, and found a fairly common street sign. The top half of the picture is the original and the bottom half demonstrates how the app will translate through the camera. If you are in an area where connection to cell or wifi service is slow or expensive (like out of the country) you are able to pre-download the languages you will be using, and then you won’t need to worry about connecting to wifi or using cellular roaming . Now what are some competitors of Google Translate? Speak & Translate has the typed text translate and the voice-to-text translation function. Speak & Translate is a free app, but it does have advertisements throughout the app, while I personally have yet to come across an ad in Google Translate. You can pay $9.99 to have a version of Speak & Translate that is ad free. Some noticeable differences, Speak & Translate does have the ability of voice recognition, but does not have the written-to-text or the “camera overtake” functions. Also something worth mentioning, while going through the details of the Speak & Translate app on the Apple iTunes Store, stated in the description is that some of the translation services is provided by Google Translate. Take this information however you like, but in my book, that’s a win for Google Translate. “Camera Overtake” can jump the text around the screen, making things a bit confusing. This is something that needs some getting used to. Here is an example of the camera jumping around the screen. This is the same sign from earlier in the article. 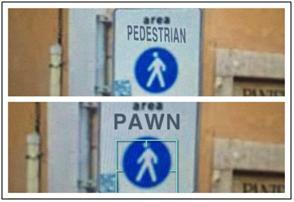 While this example is not jumping as we may normally think, in the app, the translation was jumping between pedestrian, pawn and a few other translations; this was just one that I could capture. While this app is suited for anyone, not everyone will have a need for Google Translate. 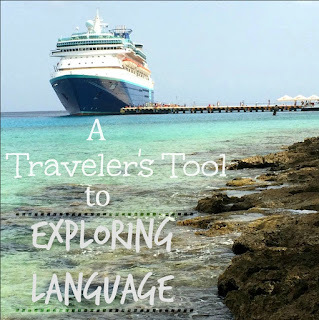 The main target market that I see this app for is for travelers, business people, or even some who are attempting to teach themselves a new language. This app is intended as a solution for someone who has come across a language barrier. While a better solution would be to learn the new language, there may not be the time or the need/want to learn a new language. The app is free ✓, easy to navigate/learn ✓, quick ✓, and doesn’t take up much space on my phone ✓; so personally, I feel that the app is worth it. While I may not need it now, I still use it. And it is funny to attempt to say something in another language, and see what may be translated. About the Author: Danica Hertfelder is a senior business management major at Tarleton State University. You can contact her at danica.hertfelder@go.tarleton.edu. Play. Google, n.d. Web. 14 Mar. 2016. "Google Translate on the App Store." App Store. Google, n.d. Web. 14 Mar. 2016. Page, Larry, and Sergey Brin. "Company – Google." Company – Google. Google, 4 Sept. 1998. Web. Store." App Store. N.p., n.d. Web. 14 Mar. 2016.